with Push-Open, silent Soft-Closing and VSD. Drawer does not pop out under accidental shaking or vibration*. 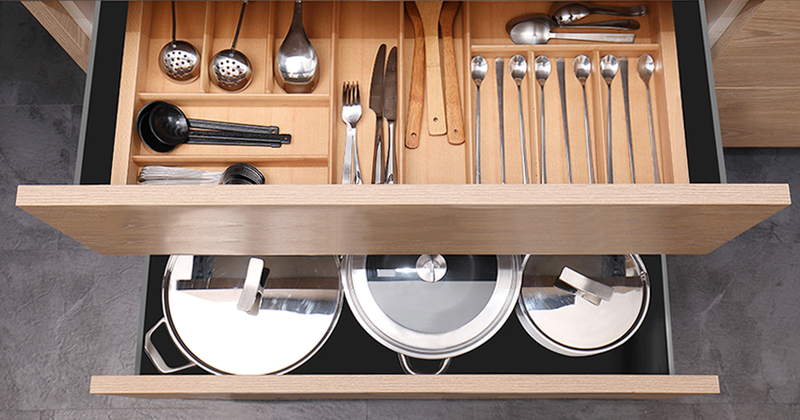 Drawer can be push-opened from a closed or any partially-opened position and smoothly soft-closed without bouncing back. Push-open function can be enabled or disabled by a simple flip of a switch. Designers are able to adjust the product function based on their needs. Push to open feature. Push any position of the front to open the drawer. The Medium & heavy duty rail systems can carry maximum weights of 40 kg and 70 kg so that even heavy drawers run swimmingly without a hitch. The exclusive locking device is built in the metal box. 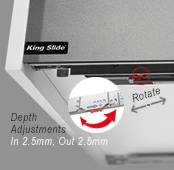 Simply insert the metal box into the slide to complete the installation or press the locking device to remove the drawer. 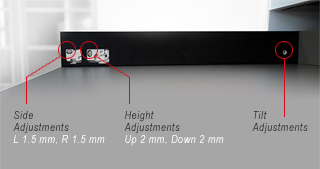 Aligning the gap around the drawer front and depth can be done more precisely with new adjustment devices.